Whether you are looking to experience nature, beautiful coast lines, celebrities, luxuries or the open road, California has got what you are looking for. 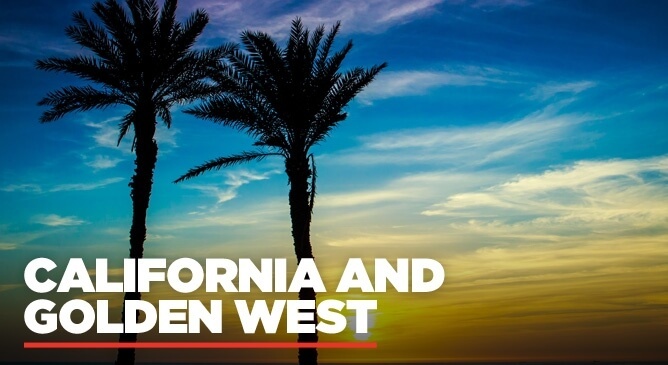 Our California and the Golden West escorted tour takes you on a whirlwind 16 day itinerary to show you all that West Coast USA has to offer. On this itinerary there is no shortage of vibrant cities and you will get to explore and visit iconic west coast cities including; San Francisco, Los Angeles, San Diego and Las Vegas to name but a few. All of these major cities have something exciting to offer you while there. San Francisco will steal your heart with it’s strong artistic culture, LA’s fame seeking streets will excite you, San Diego’s Mexican Old Town will envelop you and the fabulous Las Vegas will give your adrenaline an outing! Although taking in these cities is a must, this amazing itinerary isn’t just about the big West Coast cities oh no, it’s about all the inbetweens as well! The Pacific coastline of California is one of the most beautiful highways in the world. Rugged cliffs, frothy blue waves and some of the most breathtaking views around are to be expected on this route. We also must not forget the many beautiful quaint towns and cities along the way that you are sure to love. On this trip of a lifetime, you will take in Monterey and Carmel who hold the true small town Californian charm with their quaint shops and streets. Santa Barbara in Southern California is the picture perfect So Cal city. Spanish influence is evident all throughout the city's architecture and style. Inland our California and the Golden West Tour will take you to the beautiful Palm Springs in the heart of the desert. A city favoured by famous greats including Frank Sinatra and Marilyn Monroe. You will then head through the cactus-strewn desert towards Scottsdale Arizona. You’ll also get to explore two breathtaking national parks; the Grand Canyon and Yosemite National Park, so you can mark those off your bucket list as well! This escorted tour is the perfect once in a lifetime holiday and it really shows you and allows you to experience the best of Western America. There are many amazing inclusions in the tour but some of our favorite attractions include; Hoover Dam, VIP Tour of Warner Bros Studios, Grand Canyon National Park and the various escorted city tours. Included in your package are your flights, hotels and 16 excursions so you can be confident that you are getting amazing value for money. Allow us to help you go on the trip of a lifetime and call one of our American tour experts today on 01-8173535.